Bubble chambers are particle detectors, that are based on similar principle as cloud chambers. In the bubble chamber, the tracks of subatomic particles are revealed as trails of bubbles in a liquid heated to just below its boiling point, usually liquid hydrogen. Bubble chambers can be made physically larger than cloud chambers, and since they are filled with much-denser liquid material, they reveal the tracks of much more energetic particles. An energetic charged particle (for example, an alpha or beta particle) interacts with the liquid and the liquid enters into a superheated, metastable phase. Around the ionization track the liquid vaporizes, forming microscopic bubbles. Bubble density around a track is proportional to a particle’s energy loss. It must be emphasized that bubbles that in these devices form tracks grow on ions created by the passage of ionising particles. Thus, this ionisation process must be analysed. Each type of particle interacts in a different way, therefore knowledge of this interaction, how different particles deposit energy in the matter and how much energy particles deposit, is fundamental for our understanding of the problem. For example charged particles with high energies can directly ionize atoms. Alpha particles are fairly massive and carry a double positive charge, so they tend to travel only a short distance and do not penetrate very far into tissue if at all. However alpha particles will deposit their energy over a smaller volume (possibly only a few cells if they enter a body) and cause more damage to those few cells. 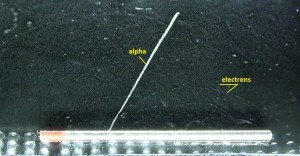 As a result, alpha particle leave short but significant trace in the chamber. Beta particles (electrons) are much smaller than alpha particles. They carry a single negative charge. They are more penetrating than alpha particles. They can travel several meters but deposit less energy at any one point along their paths than alpha particles. Therefore, beta particles leave longer but less visible trace in the chamber. If a magnetic field is applied across the cloud chamber, positively and negatively charged particles will curve in opposite directions, according to the Lorentz force law. It must be emphasized that drops that in these devices form tracks grow on ions created by the passage of ionising particles. Thus, this ionisation process must be analysed. Each type of particle interacts in a different way, therefore knowledge of this interaction, how different particles deposit energy in the matter and how much energy particles deposit, is fundamental for our understanding of the problem. For example charged particles with high energies can directly ionize atoms. Alpha particles are fairly massive and carry a double positive charge, so they tend to travel only a short distance and do not penetrate very far into tissue if at all. However alpha particles will deposit their energy over a smaller volume (possibly only a few cells if they enter a body) and cause more damage to those few cells. 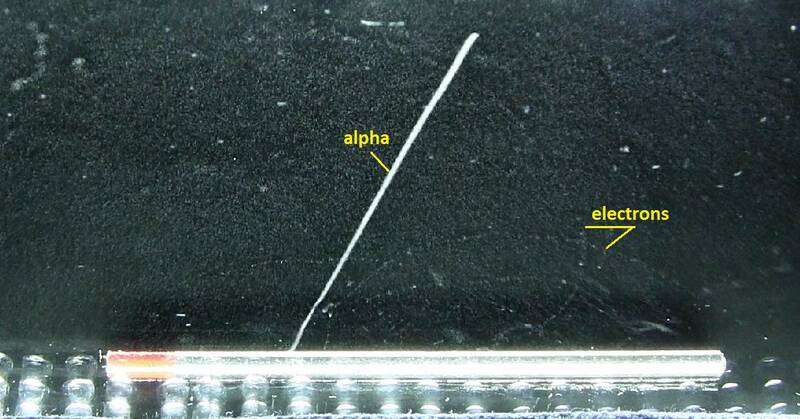 As a result, alpha particle leave short but significant trace in the chamber. According to experimental data the specific ionisation dN/dx in cloud chambers, defined as the mean number of ions produced per unit of length by a passing particle, is well described to a first approximation both for electrons and for more massive particles by the Bethe equation. ,where T is the kinetic energy of the charged particle, nion is the number of electron-ion pairs formed per unit path length, and I denotes the average energy needed to ionize an atom in the medium. For charged particles, S increases as the particle velocity decreases. The classical expression that describes the specific energy loss is known as the Bethe formula. The non-relativistic formula was found by Hans Bethe in 1930. The relativistic version (see below) was found also by Hans Bethe in 1932. In this expression, m is the rest mass of the electron, β equals to v/c, what expresses the particle’s velocity relative to the speed of light, γ is the Lorentz factor of the particle, Q equals to its charge, Z is the atomic number of the medium and n is the atoms density in the volume. For nonrelativistic particles (heavy charged particles are mostly nonrelativistic), dT/dx is dependent on 1/v2. This is can be explained by the greater time the charged particle spends in the negative field of the electron, when the velocity is low. Nature of an interaction of a beta radiation with matter is different from the alpha radiation, despite the fact that beta particles are also charged particles. In comparison with alpha particles, beta particles have much lower mass and they reach mostly relativistic energies. Their mass is equal to the mass of the orbital electrons with which they are interacting and unlike the alpha particle a much larger fraction of its kinetic energy can be lost in a single interaction. Since the beta particles mostly reach relativistic energies, the nonrelativistic Bethe formula cannot be used. For high energy electrons an similar expression has also been derived by Bethe to describe the specific energy loss due to excitation and ionization (the “collisional losses”). Modified Bethe formula for beta particles. Moreover, beta particles can interact via electron-nuclear interaction (elastic scattering off nuclei), which can significantly change the direction of beta particle. Therefore their path is not so straightforward. The beta particles follow a very zig-zag path through absorbing material, this resulting path of particle is longer than the linear penetration (range) into the material. Beta particles also differ from other heavy charged particles in the fraction of energy lost by radiative process known as the bremsstrahlung. From classical theory, when a charged particle is accelerated or decelerated, it must radiate energy and the deceleration radiation is known as the bremsstrahlung (“braking radiation”).